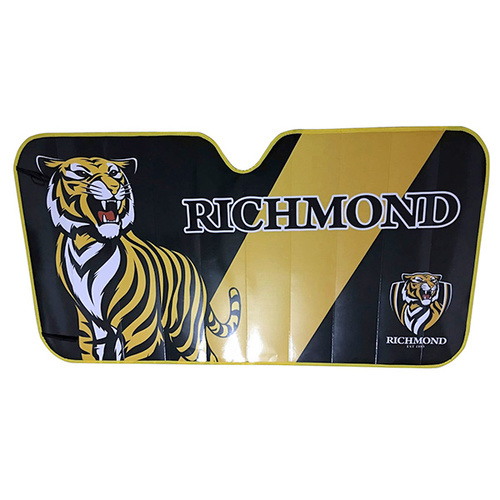 Protect your car from the harsh rays of the Australian sun, and keep your interior nice & cool with a Richmond Tigers Car Windscreen Sunshade. After my Tigers mad hubby passed away i decided to deck out the car with a few Richmond blings. This shade does its job and is easy to unfold, fold and put up. Now EVERYONE can see we love our Tiges! My dad loved the Richmond Tigers Window Sunshade. The service was great and the product was of high quality. Very happy with the price and will definitely shop with the afl footy shop again. Fantastic bought it for my brother in law and he was stoked. Need to get one for us now. BACK TO BACK TIGES!!!! 2018!!!! GO THE TIGES!!!!! LET'S GO BACK TO BACK!! WOULD LOVE TO GET MORE TIGERS MERCHANDISE FOR MY DAD AS HE IS TIGES #1 SUPPORTER! this product looks great and covers my whole windscreen not like some.